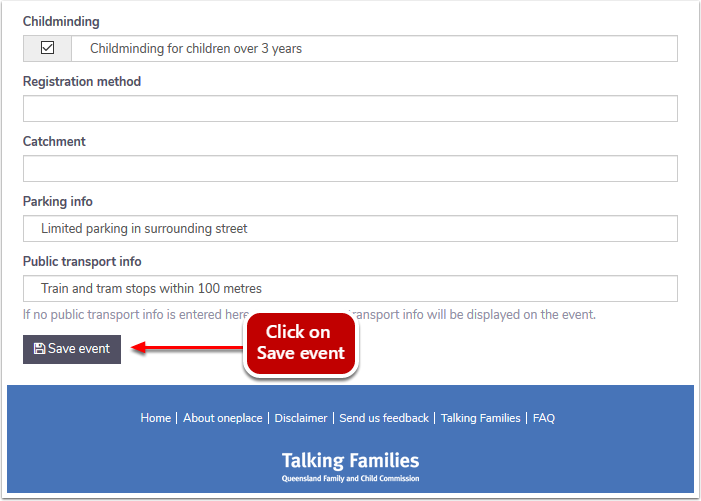 Logged in users of oneplace are able to Edit Events that they or someone else in their organisation has added. 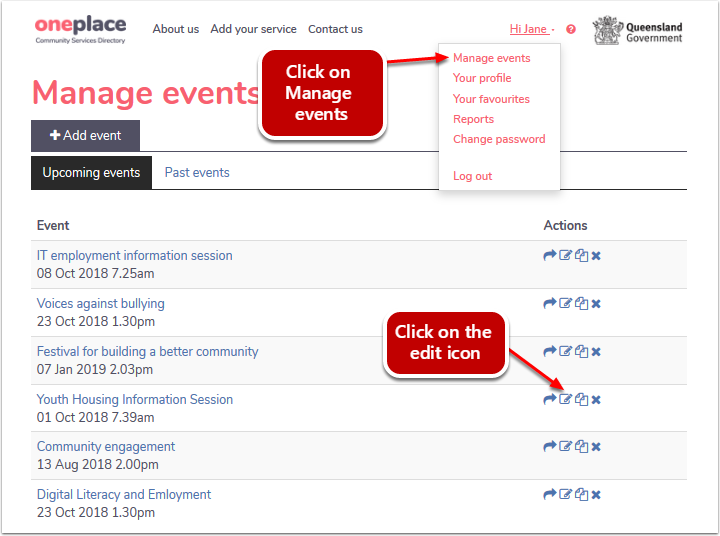 Logged in users of oneplace can edit upcoming events for their organisation or edit past events for their organisation via the Manage Events section. Select the upcoming events tab (default tab) or the Past events tab. Locate the event you would like to edit in your organisation. Click on the document and pen Edit icon next to the event you want to edit. The Edit event screen will display. You can copy, cancel or remove the event. You can edit all the fields of the event. Site - the organisation name or name of the site that the event will be held at. You will have the option to select from a drop down list to replace the current text. 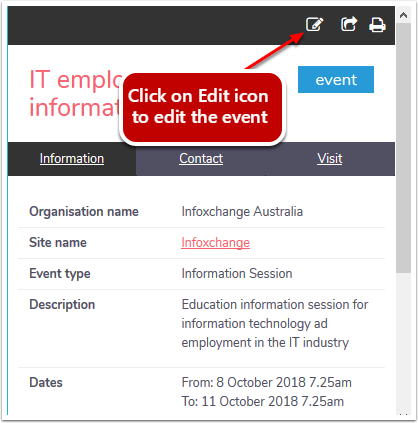 Event type - You will have the option to select another event type from a drop down list. Keywords - To remove existing keywords, click and highlight the keyword you want to remove and press on the 'Delete' button on your keyboard. To add keywords move the coursor in the whitespace of the keywords text box and select from the dropdown, or begin typing and the relevant words will appear for selection. You can select as many keywords as relevant to your event. Description is how you would describe your event in your own words. Occurrences Click on 'Delete' to remove occurrences or click on '+ Add another' button to add more occurrances. You can edit the notes and dates as required. Address - you can untick 'Confidential Address' to type in an address for the event when you want the event to list an address. To prevent the address of an event being displayed in the event listing, tick the confidential Address checkbox. Note: if you tick, confidential address your entire address is cleared. Unticking the checkbox will not re populate the previously stored address. Other details can include information such as cost, website address, interpreters available, accessibility, eligibility information, childminding facilities, registration method, catchment, parking information and public transport information. Note: the fields with a red asterisk are mandatory in order to save the event. Click on Save event at the bottom of the form once you have finished making your changes. Click on the Edit icon in the grey section above the event name. The Edit event screen will display. 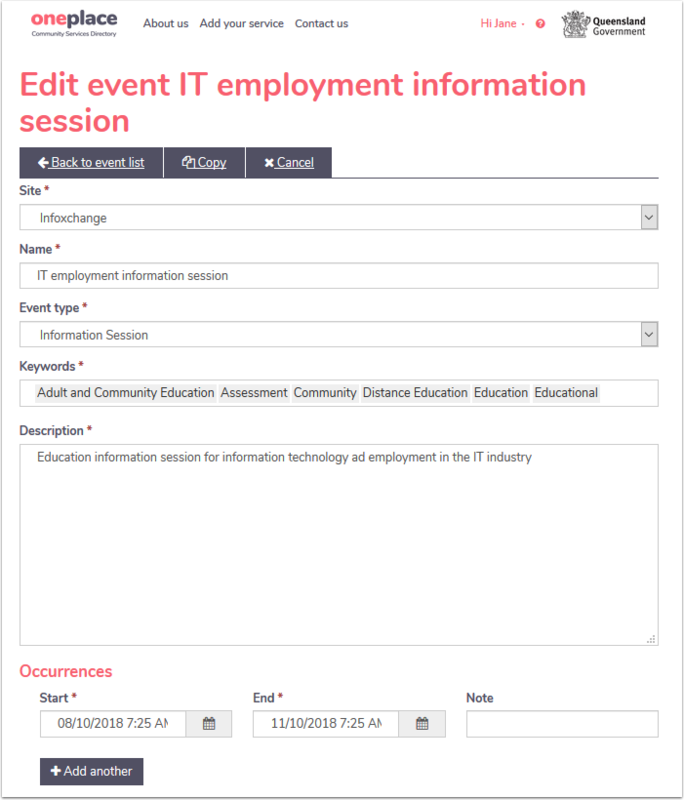 You can edit all the fields of the event provided it is an event that you created. If someone else in the organisation created the event, you can edit all accept the initial keywords.